Before we start, many of you have asked me what is the best slow cooker for your family. There are many variables for every family, but I tell you all about them here: Best Slow Cooker Choices. 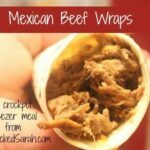 When I first saw this Mexican Beef recipe, I knew it would be a hit with our family! We love Mexican food. In fact, you will find that I always have on hand flour tortillas, sour cream, cheese and salsa. I can whip up a Mexican style meal in a jiffy in most instances. Well, this one was really good! Easy, too! 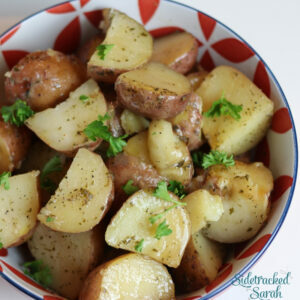 I originally posted this recipe in Week 5 of the Crockpot Freezer Meals. This is finally updated with pictures and opinions! Opinions: I, of course loved it. It would’ve been better with some guacamole on top though! Kids, even the picky ones were raving over how wonderful it was! Husband was pleased as well. Definitely a family pleaser! Blend chili powder, cumin and salt. Rub meat on all sides with spice mixture. Put chopped onion and garlic on the bottom of your slow cooker. Place meat on top. Spoon ½ cup of salsa on top of meat. Cook on low for 8 to 9 hours or on high for 3.5 to 4.5 hours. The longer and slower you can cook it, the more tender it will be. To Serve: Remove meat from the slow cooker and place on a plate. Use forks to shred the meat up. Skim any fat from the cooking liquid and throw it away. Return meat to juices and mix well. Place meat on warm tortillas and top with cheese, tomato, cilantro, avocado and salsa. To Prep for Freezer: Chop Onions and garlic. Cut meat into quarters. Rub meat with spices. Place meat, onion and garlic into Gallon Size Freezer bag. Label bag with marker and freeze. Don't forget to keep 1/2 cup of salsa on hand to put on top after you remove the contents of the bag and place in the slow cooker.